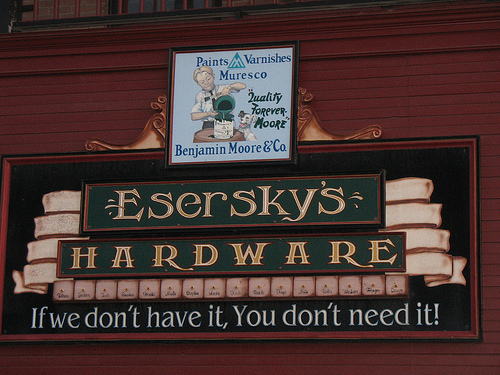 Yeah, we used to have a hardware store like that. No matter what picky little part or tool you needed, they either had it, could offer a reasonable substitute, or would order it for you and have it within a few days. The place was family owned and had been around for generations. The people that worked there actually did stuff and could offer advice on how to go about something or what you’d need before you got into a job. Sadly, they closed up shop when the “big box” stores went up. And you can usually park right in front. Easy in, easy out and no looking for your vehicle. The reason for this post was the discovery of Detroit Hardware on Woodward. I needed a can of clear-coat for a project, and they were within a brisk walking distance. Highly recommended to Detroiters in search of knick-knacks. Believe it or not, at the end of my dirt road (where it meets the paved road), is Woody’s Store, where you can get plumbing fixtures, electrical supplies, hardware, paint, ammo, and produce grown on Woody’s farm. This is all in Silk Hope, NC (and you can look it up, the road is called Woody’s Store). Burke Brothers Hardware, 5227 Hillsborough Street, Raleigh, NC. On the corner, parking in front or the side, you name it, they got it or else know where you can go. 15 pounds of hardware store in a 10 pound volume (is it related to a TARDIS?) Floors don’t all match in height, so you know they’ve expanded over the decades; that’s a GOOD sign. Smells like a hardware store should, too. In an area known for friendly people, they put the icing on it.